1. use as a jar lid cover for a 3-1/2" lid. 2. as a doily that measures 6" diameter. (Dc in next st, ch1) around. Join with sl st in 3rd ch of beg ch4. R3: Sl st in next ch-sp. Ch3, dc in same sp. (Ch1, 2dc in next ch sp) around. Ch1. Join with sl st in top fo beg ch3. R4: Sl st to next ch-sp. Ch3, 2dc in same sp. 3dc in ea rem ch-sp. Join with sl st in top of beg ch3. R5: Sl st to center dc of 1st 3dc group. Ch1, sc in same st.
(Ch4, dc in center dc of next 3dc group) around. Ch4, join with sl st in 1st sc made. R6: Sl st in next ch sp. Ch3. 4dc in same sp. Ch1. (5dc in next ch sp. Ch1) around. R7: Sl st to center dc of next 5dc group. (Ch3, sc in next ch sp. Ch3, sc in center dc of next 5dc group) around to last ch sp. Ch3, sc in next ch sp. Ch3, sl st in 1st sc made. R8: Ch1, sc in same st. (5dc in next ch-sp. Sc in next sc) around to last ch-sp. 5dc in last ch-sp. Join with sl st in first sc. 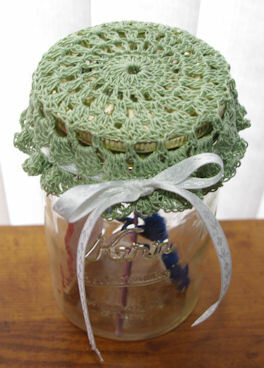 after weaving ribbon, center on jar lid and draw up the ribbon and tie a bow.